Remember Dorothy Ann on The Magic Schoolbus? She was the smart one. 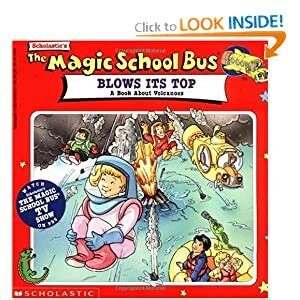 You ALWAYS knew she was about to say something smart because beforehand she would say "According To My Research" and then give her key fact that would help Miss Frizzle's crew in their adventure. Found this pic from Amazon. Dorothy Ann is the one in the pink! Yesterday I went on an adventure - on the internet! I hyped and added the look below to my Lookbook favorites a looong time ago. And I FINALLY found skirts similar to the one she is wearing. She describes it as a "Stella High Wasted Layered Bubble Skirt"
I looked it up and Stella is a brand in Australia. Sadly I could NOT find the website of the brand anywhere and there was not anything from the brand on ebay. So this forced me to look harder. If you type in "High waist layered bubble skirt" to any online store, ShopStyle, even Google, you don't get ANYTHING that looks like her skirt. So I realized that the style terminology for the skirt had to be something different from what she said. I had to use my training at the Costume Shop and nerdy knowledge of fabrics and sewing techniques to help me on this one. 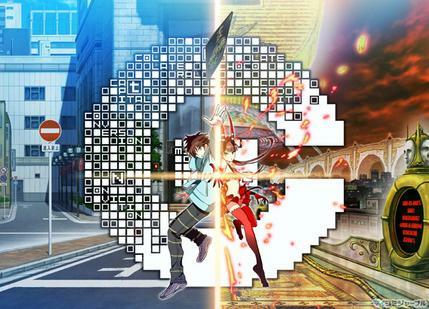 One thing I noticed is that the skirt has a hem that makes a half circle pattern around the bottom of the skirt. This is called a scalloped hem. The scalloped look has "layers". The curvy patterns are on an upper layer of the skirt. However this layer is not layered on top of the other one thus not making it "layered". Actually, the layer of scallops (?) is picked up or hitched up. Thus making the skirt a Pick Up style skirt or a Hitch skirt. It doesn't end there! Notice how the skirt has more fabric around hips and then gets thinner toward the bottom. This is called a tulip skirt. Because the hem is tucked back and puckers out a little bit, it is a bubble hem. So this skirt is actually a Stella high waist, scalloped bubble hem, tulip hitch skirt. That's FIVE styles AND a brand in one skirt. It is a VERY unique piece which is why I WANT IT. However, like I said before, I cannot find anything Stella so I needed to find an alternative. And I did! I have to admit. I'm not the biggest fan of Bubble Hems. 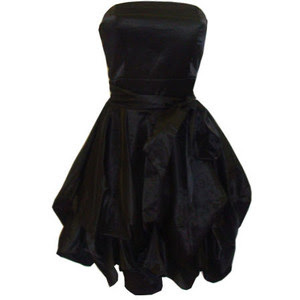 I remember when the Bubble Skirt hem was on almost every trendy dress imaginable. I thought it was cute when done right. However my mind was saying let's go! But my thighs were saying NO! I did notice that if the hem was not straight across or if the skirt was a tulip style, my legs looked smaller. So the scallop and tulip style makes the lookbook-er's legs look small because it makes her hips rounder. The hitch style gives the skirt more volume and contributes to the roundness of the tulip look. 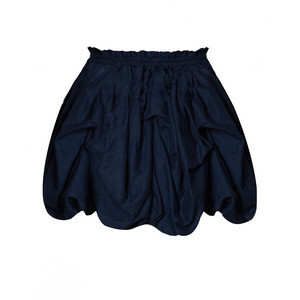 This skirt is dark blue, has the scalloped, bubble hem and the pick up effect that looks like layers. However I do not think it creates the tulip effect I am looking for. I think because it is round all over it will flare out instead of curve inward. This skirt too has the bubble hem. It is scalloped on the bottom but a bit pointier on the edges which means it will curve inward instead of out. This will have more of a tulip effect than the skirt above but it is not a tulip skirt or dark blue. This dress had the scalloped bubble hem and a hitched layer of fabric. It even has the effect of being larger in the hip area and then getting smaller, like a tulip skirt. Yet, it is a dress. 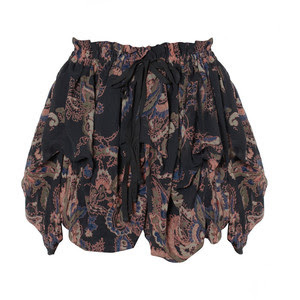 This skirt I found on ebay has a scalloped bubble hem and has a hitched layer of fabric. It is a dark blue color AND from the way it is placed on the ground I can tell that it is a tulip skirt. See how it gets wider and then gradually curves and gets smaller? I went ahead and bid for it on ebay so we shall see if it will be what I was looking for in a few days! Do you think I did a good job finding similar pieces? What about the one I bought? Have you ever had to find an alternative for an item you just could NOT find? Let me know and comment below! Also, be sure to tell me your reaction! Dude, magic school bus was freakin amazing! Cute skirts, I like the first two. hahaha i feel like everything about this post is me! i've been looking for something like this skirt online too, but i didn't have as much knowledge about phrasing as you did :] thanks for your help! hopefully i can find something like your ebay find as well.